To Live Life... I've been practicing living life and enjoying it. Enjoying life without updating social network status after status with moments I would rather spend lavishing in as every second unfolds. On this Personal 8 Year I find that I am more busy than normal with projects and ideas that need attention, so I appreciate knowing that I can save the moment by simply setting aside time to gather any cherished memories I wish to share here on this personal matrix platform at a different time. I do appreciate the effort you take to visit me here, to hang out, and show your support. Thank you! Before I decided to experiment with this concept throughout the past year, I was spending my free time playing on Facebook that I missed out on tiny and big details of life experiences with my loved ones... I also noticed that by scattering my Gemini energies elsewhere, I was not completely focused on building my dreams into reality for Novum137 (my Lightwork and Divine Soul Mission) and on my self-love, self-care, self-acceptance healing. It is partly the reason that for the past year, I would be on introspection-meditation hiatus for long stretches at a time... During times of silence, I am implementing action. I am exercising my being into focus, back to center, and grounding in order to complete any tasks left undone before allowing this little party animal to frolick in the matrix sun of online social media and earthly whatnots. I do take joy in the time I spend on Facebook (when I do) because it is a great time of interaction with friends to foster love in our relationships, and sometimes it is the only way to do so because not all of us like to blog for a variety of reasons, like it being a ton of work and energy. I blog because --hey, let's be real -- I like to TALK! And talk, and talk, and talk, and share buttloads of pictures with more talking. The point is that I thrive on exercising my brain and using my skills in communication, and Facebook is not a suitable place for me to blabber on and on about my personal creative-spiritual expressions that happen on divine fly. So, now I will only be posting a little there to focus and share more here about things that inhabit my brain, body, soul, and life with friends who are interested in spending intimate time together. Several weeks ago, I added a “Travel Events” page and decided to password protect it. I also tried to password protect this Soul Journal blog page, but I discovered today that doing so would prohibit me from managing a subscribers list. So, unfortunately, that’s out the window. But I will keep the password on the Travel Events page simply because I don't like stalkers. Stalkers are bad. Hmm, I feel like I'm forgetting something... Oh yes, I will still be on Facebook as much as I can to keep up to date with what each of you (friends that are subscribed) are up to and to celebrate in your cherished memories. My intention is to use energies wisely by focusing on friends that are present and supportive of me in return; the ones that show up here at Novum137, rather than having my energies ineffectively spent. This helps to weed out the weeds and tend to the blossoms that fill my life because it is up to me to choose what I wish to fill my life with. I choose all things beautiful -- beautiful experiences, beautiful friends like You, beautiful treasures, beautiful etceteras, etceteras, etceteras. First, let's take a look at my latest custom designed necklace, "The Birth of Venus" created in honor of Goddess Aphrodite, the beauty of the Divine Feminine, and of Divine Mother Ocean. All custom sacred adornments are designed with intention and divine guidance by the Angelic Realm, the Higher Spiritual Realms, the Higher Universal Energies, Faerie Realm, Numerology, symbolism, and nature as an integral part of my divine creations. So that's the Birth of Venus! Now, let's mosey on over to "The Luna Moth Queen". Where do I begin? A mask. Yes, a mask. Not just any mask, but a Luna Moth mask. On July 3rd, a new Buddha found me. A reminder of my Dharma, of my Eightfold Path journey. I was Angelically guided in late Spring or early Summer 2015 that my spiritual journey had to do with the Eightfold Path and on this July 3rd, this Buddha called to me in confirmation that I am on the right track and living my Divine Life Mission. I celebrated the day dressed in part of my Luna Moth costume when Jaxon and Kingston said to me, "Mom, you are a Luna Moth Queen." They called me Luna Moth Queen throughout that day, and still to this day they truly believe that I am. I have always been attracted to Luna Moths; they have been popping up on my Instagram or Facebook feeds since Summer of 2013, but I have yet to actually encounter one. Maybe I live in too high an elevation, I don't know. Maybe when I have time I should look up what regions provide the perfect climate for their existence and plan a trip to visit one of those locations (maybe that's overboard)... Anyhoothoot, I decided that since I keep seeing Luna Moths everywhere, except in the flesh, I might as well become a Luna Moth dammit! I started looking up random Luna Moth-esque things on Etsy when boom - a Luna Moth mask, all pretty and ready to be loved appeared. And with a tap of finger, she was united with me. This year I plan to "live" a little and dress up for the Renaissance Festival as a Luna Moth. Actually, I plan a lot of costume play and whenever possible I would like the whole Fam to do it as well. I grabbed two extra masks from KoiDesignsArt (a Horned Owl and Dragon) to start my collection in case Tristan or his dad felt like being a little festivo with me. I didn't stop there... I am so excited to tell you that I finally decided to go for it and let my new pair of wings shine in the physical world - shine as shiny fuzzy Monarch Butterfly wings to be exact. I've been ogling over this cape since a couple Springs back, and, heck, this mademoiselle deserves a little decadence! The cape shipped out not too long ago and now I'm in the market for an outfit to go with my wings, something cute to wear at the coming Fall Lantern Festival outlined in the Travel Events page. Since the special Summer Solstice Full Moon of June 2016, I've been entranced by all things Luna Moth and Butterfly. One of the projects I'm tinkering with is a Luna Moth necklace. I experimented with green patinas, but ended up deciding to go raw metal for this pendant. I'm considering using the green patinas for Luna Moths on handcrafted dreamcatchers instead... I'll let it speak to me. Oh, Luna Moth dreamcatchers! Not too shabby, eh. Since this new Buddha found me, my life has been feeling renewed despite the high emotional hard truths brought on by the New Moon in July aspects. It hasn't been breezy, but I'm a natural at accepting hard truths and at letting go what does not serve my divine soul mission. I'm doing my best by focusing on things that attract positive energies into my life. Things like exercise, eating healthier, Feng Shui, figuring out what and how I want to spend my time... Just doing things my way, which has a bit of a learning curve since I'd always lived my life for others. In this part of our little time together, I will share my Career Path space, Meditation space, Gym space, some sacred adornments I've picked up at the Mind Body Spirit Fair, and health food products that I'm totally digging. I will share a lot of pictures of my New Moon candle magick, and other thingamabobbers. Oh yes, pictures of Kingston's Bday from June 16 -- I definitely want to share that and, and, and before I forget... We won free tickets to watch the new "Finding Dory" movie. I don't go out to the movie theater much. Honestly, the last movie I watched was the last Harry Potter film. That is why I'm looking forward to sharing about that. Yes, I know. Sad. 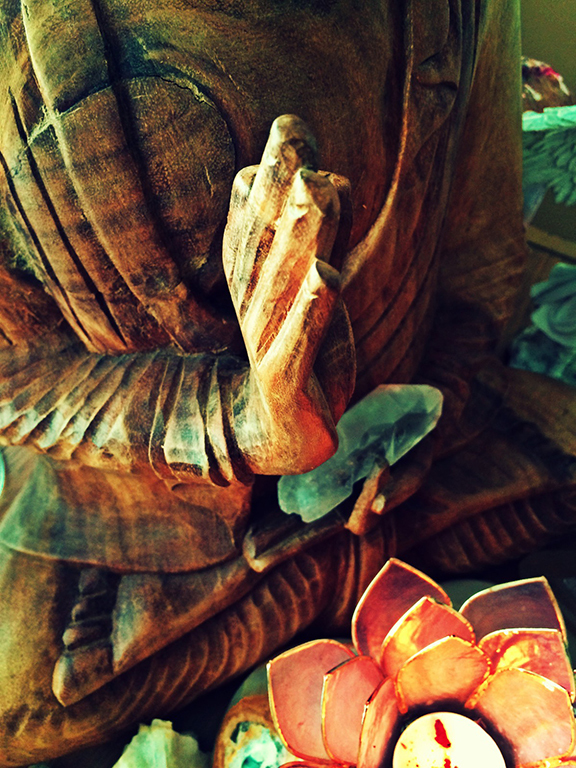 Btw, I keep the Eightfold Path Buddha on my Career Path Altar which is also located in my boudoir. I've combined the Buddha with the Vanity which represents fulfilling my Dharma to live in balance with the material and spiritual worlds. So, all the Buddha pictures, the Vanity pictures, the New Moon pictures, and the Candle magick pictures are all from the same area - the Career Path Altar/Vanity Boudoir. The Career Path Altar/Vanity Boudoir is all about how I choose to live my life in beauty of what this world has to offer, of how I see the world, "not what it is, but what it can become" with faith, hope, love, light, joy, trust, and positivity of my actions. I see only beauty in all things. I clearly see how divine beauty embodies all of existence because I see God in everything. July New Moon candle magick. Right before my eyes, one flame turned to two, then turned to three as it completed a dancing cycle into a single flame -- a single flame powerfully cracking the pillar straight down the center. The fire's vigor caused an eager black river flood to puddle over stones and across the altar. It was quite the show. I was determined for the candle to last more than a couple of hours, so I did what I could to rig the crack and tame the flame (a pillar this size will burn for at least five or more days). After the spectacle, everything looked safe and contained so I went about my day before gazing into the flame one more time before bed. A frenzy triple hissing blaze woke me from a deep sleep and as I watched the fire push and pull into itself again and again before resting into a hot strong hold, I thought to myself, "miracles are taking place." I hand-carve symbols, intentions, prayers, and spells into all my candles before anointing and sprinkling with magical toppings. The Serenity Prayer is one of the prayers written; it felt like the perfect affirmation to get me through foggy times. Can we backtrack a little? Oh can we?!! Ok, awesome... Let's go to the week of the Summer Solstice Full Moon. It was a very full schedule, let me tell you. We had just returned from the Lantern Festival before we needed to begin preparation for Kingston's 4th Bday on June 16th. We spent the day at the Denver Children's Museum, which I must say is one of the best children's museums we've been to; we've been to quite a few. It was such a blast for them to experience that I barely got enough snapshots of Kingston because he was all over the place -- a lot of his pictures were either blurry or of his back. After a satisfying play, we headed home for cake. Oh man, cake. Let me tell you (again), how happy I am that Kingston has a soft spot for cheesecake -- score! Their dad helped me get everything ready; I was looking forward to using the special colorful flame candles that a friend had mentioned about using for her daughter's Bday cake a week or so before... Kingston could not stop expressing his deep gratitude for his birthday. Such a sweetheart. Aww, it was such a wonderful day, I confess that after they ran off with bellies full of cake, I cried a little bit, but only for a little because it was time to start preparation for Father's Day and the upcoming Summer Solstice Full Moon. Blue puffy crystal being is Cavansite. A rare crystal from India. Promotes enthusiasm, optimism, and curiosity. Assists users seeking revelation, enlightenment, and breakthroughs. The lady I bought this from is so fricken cool - she's in band. For Father's Day, we took a small day trip to the Mind Body Spirit Fair in Fort Collins. Several months earlier I attended the same event down in Denver with a girlfriend. Fort Collins was much more laid back - there were less vendors, but still I made a bunch of friends, and this time we all went as a family. The natural Infinity Amethyst Stalactite is from a vendor who is American, but has made Thailand her home. She has a wonderful selection of handcrafted jewelry and clothes, which you can only see at Fairs she happens to travel to. Tracy has an e-commerce website where she carries crystals for purchase called Gypsy Healing Garden, but unfortunately, the handmade jewelry and clothes are not listed. It was awesome meeting her and seeing her work. The dazzling sparkle pendant pictured is a Bio-Energetic Revitalizer which increases energy and stamina, provides superior EMF protection, and helps reduce stress. I had crazy fun at Claudia's booth; she is just amazing with an amazing story behind her creations. If you want to get the special man in your life something meaningful and he happens to keep a cellphone in his pockets, then I highly recommend you gift him some pocket stones to keep in his pants. I'm pretty certain he would appreciate that you appreciate his sacred man tools enough to protect it from harmful EMF rays. You're welcome. Nuff said. 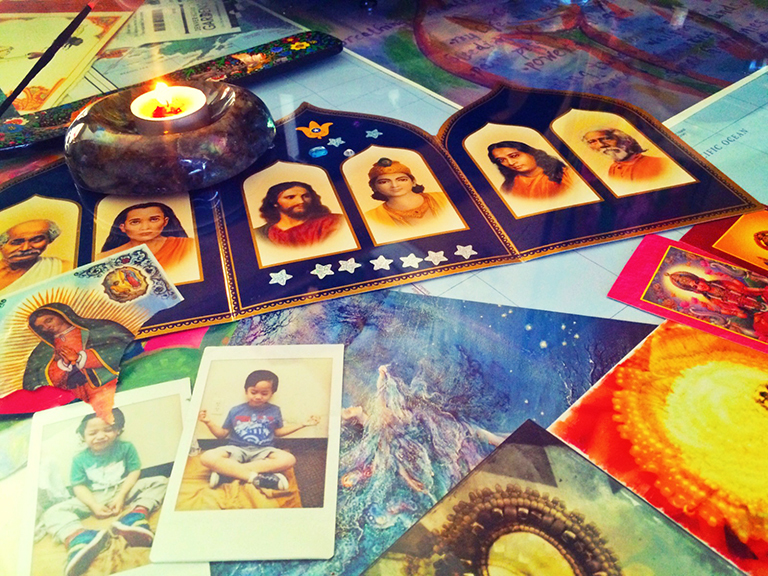 Tarots at your doorstep. Yeeahhhh, that's what I said, a monthly subscription box for Tarot lovers delivered right to you! I'm in luv with Sherry Padilla's idea. I'm so delighted that she's located in Denver with her Meetups, Tarot parties, private readings, special events, etc. Interested? You can check it out at Tarot Box by Reckless Reader Tarot. After all the hustle and bustle for friendship making it was time to head home for a family barbecue and leftover cheesecake. Normally I go all out with rituals, but this time I opted to rest and soak by the fire with smores and the family. Around the fire, we each had a turn saying what we were grateful for. Nothing happens by chance, the seats were assigned. I ended up with seat Number 10 - the number of completion, endings, new beginnings, leadership, etc. We were being rewarded by the Universe with gifts and blessings. Thank you Universe and Angels. I feel I deserve a cruise next and welcome all that I deserve. Aum, peace. Feeling comfortable in my skin... The older the boys get I find that I have more available space to fit in a little "me" time and address my physical health. Some days it means time spent in the basement gym, or outside tending the rose bush and minding the garden, or going out exploring. Whatever it is at the moment, I always find myself in motion, in creation, or in meditation. I really do desire socializing with friends on social networks because the love around friends is a welcome healing energy. I always intend that "today" I'm going online to play, but first I must do a little work on the blog, respond to emails, clean out my inbox, yadda-yadda-yadda. By the time I'm done, I've had my fill of staring at a screen, then it's time to move my body again. There are moments I wish I could hang out with you at my place so we can chat as I move around juggling because as much as I enjoy the matrix world to chit chat, I prefer close one-on-one interaction. My favorite form of love expression for my friends is when they come over because that means I get to fill their bellies with crepes, waffles, and whatever food extravaganza I have stirring and brewing in my kitchen. So again, yes, I'm doing the best I can as I feel my way around this Personal 8 Year energy. One of the main strong vibrations I'm riding this 8 Year is geared towards body awareness. All things health, fitness, and active. I'm ambitious. Everything I do must be efficient with an inclination to remove distractions in order to focus on taking actions needed for heart desires to materialize. Especially now in the present situation, where laying solid foundations is critical to financially support myself and the boys. This platform provides a healthy opportunity for me to maintain communication with you as I establish my brand and place in the world. Please bare with my intermittent absence on social media as I adjust to the big changes taking place. Fatigue is beginning to be a past memory as I provide my body with the right oil to get the engines rollin'. It's a wonderful way to feed your body what it needs. Be sure you're feeding your body with the right nutrients possible every several hours to maintain a good metabolism. I make an effort not to go several hours without feeding my body otherwise, when we put our bodies through long periods without eating, our metabolism starts to slow down to compensate. Remember that our body also uses calories when we are at rest and when we sleep to function so we must look after it by providing proper sustenance. I find that I crave less sugar and am living a mindful, healthy, active life these days. With less sugar and no more major high caloric (empty) food binges, the inches are surely making a run off my waist. Plus, since the Healthy Skoop containers are food grade, I recycle them as food containers to store cold pastas or salads for picnics and long road trips; the shape is perfect for organizing and stacking in a cooler. This journey to health began with a meditation practice, which led to taking the measures for a healthful life through extra physical activity and making healthy diet choices. Meditation helped me take back control of my mind and my body, and reclaim my spiritual nature. Spirituality and meditation are the grand wheels of change that sparked a radical transformation towards healthy, happy, balanced, authentic living. I am thankful for the miraculous events and results meditation has brought into my life and have combined many areas of living spaces to also accommodate a meditation practice. One "room" in particular is solely a God Communion space located in the east basement level, shown here. I thought it would be nice to share our basement gym and meditation spaces with you. For a time I have contemplated whether I should have a hand in my children's spiritual foundation knowing that we each have our own personal spiritual journey to figure out in this life. As you know, we all have individual lessons to learn in this world. This is why human beings are provided with a myriad of cultures, backgrounds, social and religious institutions that resonate with unique and connected processes. All cultures, backgrounds, social and religious institutions exist in order to accommodate humankind's individual spiritual lessons, personal "School of Life" progress, and desires to define oneself. As we grow, some of us are like truth gypsies traveling in search of divine truth and into expanding self-spirituality free from the confines of any one set of belief systems. Understand that when we take it upon us to define ourselves by social or religious cliques, by social status, by relationships, by our partners, by our careers, or by whatever category you can imagine, in order to feel as though we belong with a group or have value -- we automatically limit our unique identity by those definitions. Simply, by defining our personal worth through external factors, we create self-barriers from our infinite potential. I have stepped outside boundaries and circles to take leadership of myself in December 2014 because I understood that all answers already live in my heart... I have learned to trust the heart, follow its lead, and I will always know the way. Once living in an awakened divine state of being, you are the only leader qualified to lead your world and to lead by positive example for those still finding their light. In an enlightened state of being, things are looking more and more cliché and is partly the reason I have a fickle motivation for social media. These days, I like to read, write, exercise, create, soak in the stillness of divine love through meditation, or experience the sensual creative presents of life. As a Gemini, I treasure everything, but mostly I treasure my wings. My wings are an extension of my freedom... And I extend that love of freedom towards my children in certain aspects of their upbringing, like spirituality. However, in honor of following my heart and holding the torch, last Sunday after the boys first "How to Live" school experience, it was clear to me that this is a part of their journey and I am to begin facilitating a healthy start of discovering self-realization through teaching them the Dharma, which includes "The Eightfold Path" of Right Understanding, Right Thought, Right Speech, Right Action, Right Livelihood, Right Effort, Right Mindfulness, and Right Concentration. I will be their foundation as their divine plan weaves and falls into place -- the spiritual foundation until they take the responsibility of their connection to Spirit, to all our kind, and to all of existence into their hands. This is completely new to me, but I am sure to be successful at everything I put my mind and action to. We'll start with a chant, a prayer, followed by a three minute meditation, then a story before bed and we'll go from there building as we grow. Naturally Jaxon and Kingston are exhibiting their intuitive, empathic abilities. They show interest in my practices and of how I see and feel the world by my heart. From that spark of interest, they deserve my attention and assistance creating a meditation space of their own. 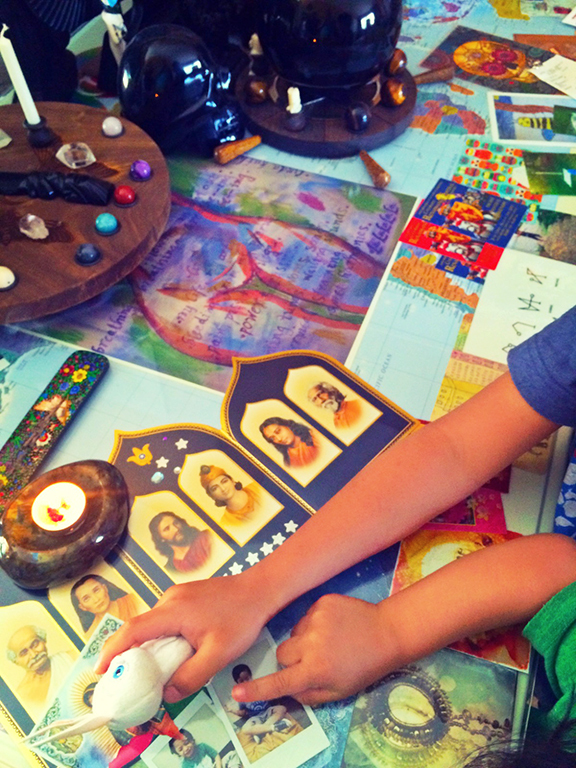 I placed Kingston's travel altar in my "Helpful People, Travel Area" so the Gurus of Self-Realization Fellowship join us in our spiritual and physical journeys no matter where we are across the globe. 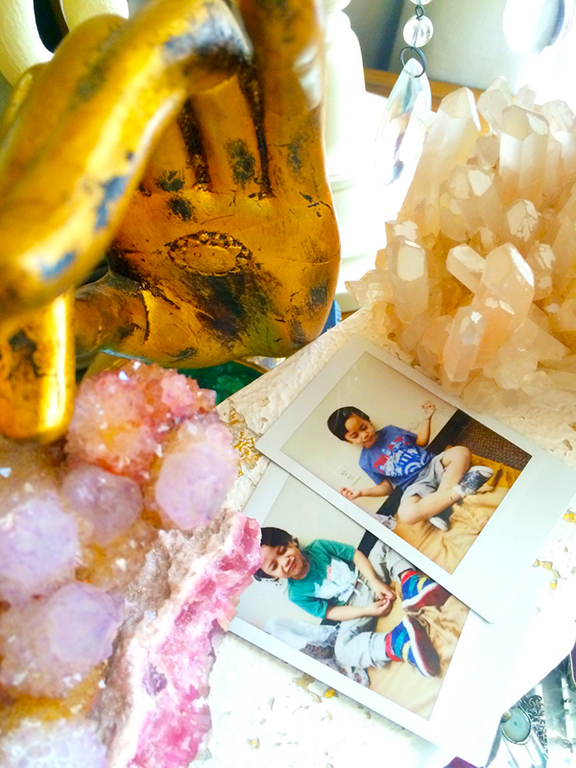 Jaxon chose a spot for his altar in their bedroom and did a remarkable arrangement for their new practice. 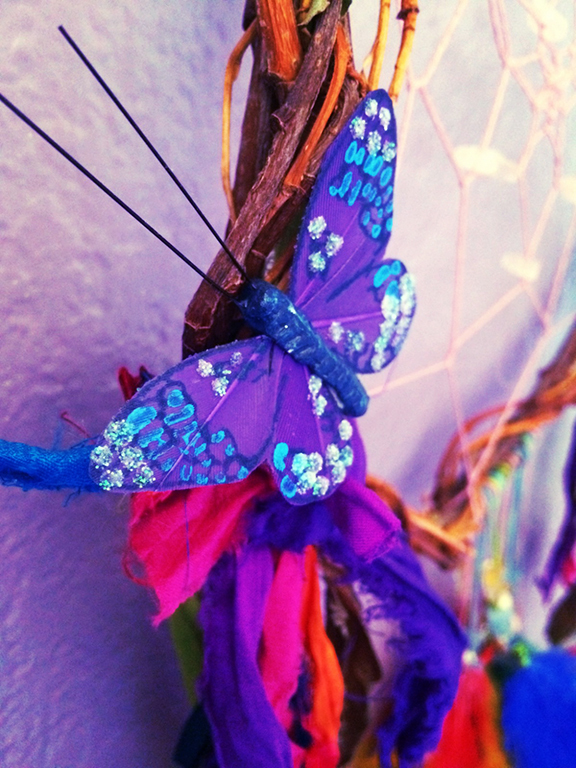 I helped hang up the dreamcatcher that I made for them during the week of last summer's rare portal "888 Lion's Gate". Well peeps, give birth to your Venus, be a Luna Moth once in awhile, discover your path... Know that you are worthy and valuable of your love. You are perfect how God made you; be kind and loving to yourself, for your true divine nature is one of perfection. Feng Shui your space to-da-hizzay to increase positive chi into your life. Treat yourself to positive experiences that add to your happiness and to everything that completes your oneness with the Divine. May the Divine Force lead with you. I truly hope you enjoyed our time together. Thank you for being. Infinite Blessings and Pure Love always, in all ways to you and yours. Ah Seh Nai. Aum. Peace. Amen. Jai Guru.